A floating map, Enterprise 20 hexes from left side, Reliant on left most row, both speed three with weapons fully charged. There are no shields. Phasers are disabled if the warp drive gets damaged due to redesign. There is no OEW beyond that needed to get a lock. Reliant has 4 points damage to forward hull, and two points damage to phaser bank 1. Enterprise has 6 points damage to forward hull, 3 points to primary hull, destruction of torpedo tube 1, and 2 points damage to the reactor (no criticals in effect). For both sides, victory comes to the survivor at the end of the fight. The Federation has a major victory if the Reliant is disabled, and not destroyed. Khan followed Kirk into the Mutara Nebula. As expected, shields and sensors failed to function effectively. Khan, being a 20th century commander, was unused to a three dimensional battlefield, and Spock was able to deduce this from his manoeuvres. 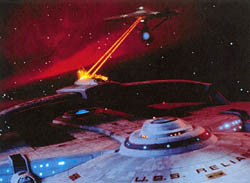 Eventually, Kirk was able to outwit his opponent, destroying the Reliant’s photon torpedo launchers and warp drive, thus also disabling the phasers. Mortally wounded, Khan activated the Genesis Device believing that he would take Kirk down with him in the resulting explosion. Ultimately, Captain Spock sacrificed his life to repair the Enterprise’s warp drive, allowing the vessel to escape the Genesis effect that created the Genesis Planet.